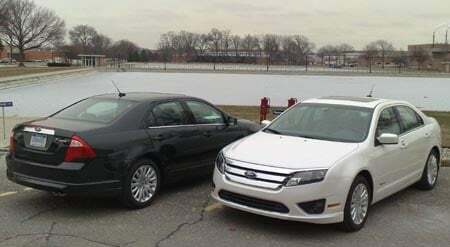 This week’s Wednesday Walkaround takes place on a brisk 15 degree (F) day in Dearborn, Mich. as we check out the all-new 2010 Ford Fusion Hybrid. The calendar does not quite read 2009 yet but we have already driven our first 2010 model automobile. Ford Motor Company invited journalists up to the Dearborn, Mich. world headquarters recently for a “hush-hush” sneak peek of some new product soon to be unveiled to the world and also provided an opportunity to drive a vehicle that will be arriving in showrooms as early as spring – the 2010 Ford Fusion Hybrid (and sister car Mercury Milan Hybrid). For 2010, engineers and designers have given the midsize sedans entirely new front and rear clips as well as totally refreshing the interiors. In addition, powertrain upgrades have been added including the new hybrid systems we tested. The new Fusion (and Milan) received quite a few stares in traffic around the big blue oval’s stomping grounds, a testament to the much-needed makeovers given the popularity of the new Chevy Malibu redux. This new car is quieter, more comfortable, rides and handles better, steers better and, in hybrid form, gets incredible fuel economy without sacrificing much in the performance department. 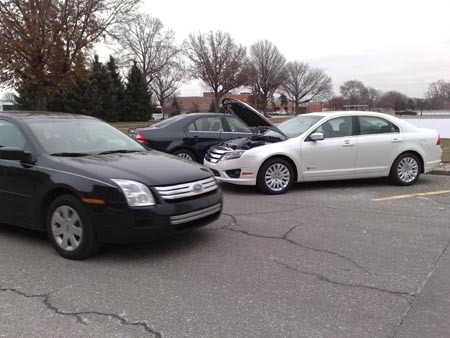 All 2010 hybrid vehicles from Ford now feature the second-generation gasoline/electric hybrid technology developed 100 percent in-house by Ford. The new Duratec 25 2.5-liter inline four-cylinder engine handles the internal combustion duties while the permanent magnet electric motor it is mated to is powered by a lighter, more powerful, more efficient high voltage battery pack. All of this combines for improved acceleration, smoother transitions between gas and electric motors, a new, extended EV mode-only range of up to 47 mph and fuel economy rated to test as at least 39 mpg city with some early testing seeing as high as 43 mpg. Ford engineers have increased electric motor efficiency 130 to 160 percent and are now able to recapture up to 94 percent energy when braking. The new hybrids also now feature electric air conditioning compressors thereby reducing engine drag and further enhancing comfort and fuel economy. A new instrument panel was developed for the new sedan hybrids, dubbed SmartGauge with EcoGuide. 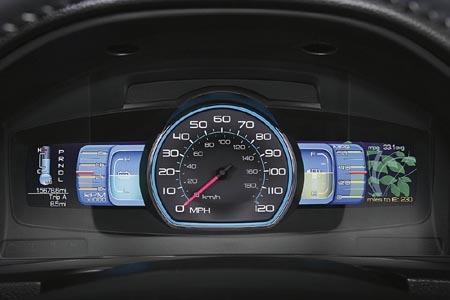 A large, central speedometer is flanked by a pair of 4.3-inch TFT LCD screens that provide reconfigurable information displays of hybrid performance and operation. Drivers can choose between four display modes that vary the amount of content provided on the monitors. We are greatly impressed with the work Ford designers and engineers have put into the new Fusion and Milan midsize sedans for 2010. A new sport model is added to the Fusion lineup as well and will offer Ford’s 3.5-liter V-6 and all gas-only 2010 Fusion models are backed by six-speed transmissions, manual or automatic. 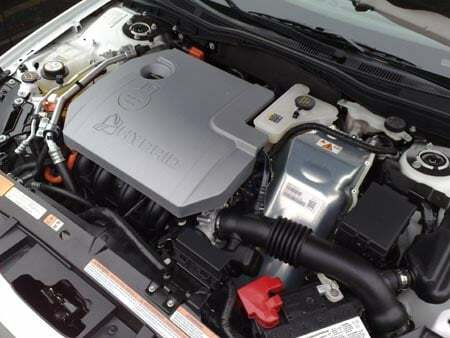 The hybrid models get the Aisin Powersplit E-CVT automatic. 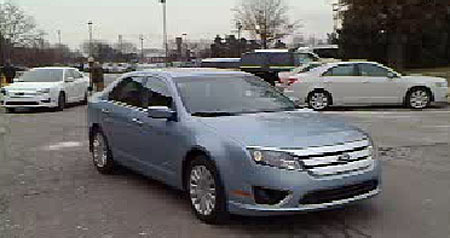 Pricing for the 2010 Fusion lineup has been announced and starts at $19,270 for base S models. The new Sport begins at $25,828 and hybrid model Fusions start at $27,270 base MSRP. 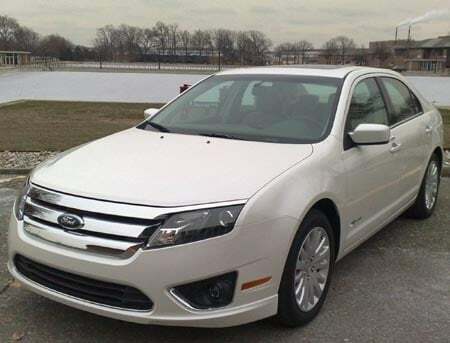 Ford has done an incredible job with the 2010 Fusion and Mercury Milan models and that is just the tip of the iceberg of things to come (but we can’t talk about those just yet). First “slip of the lip” will come next week in AutoworldToday.